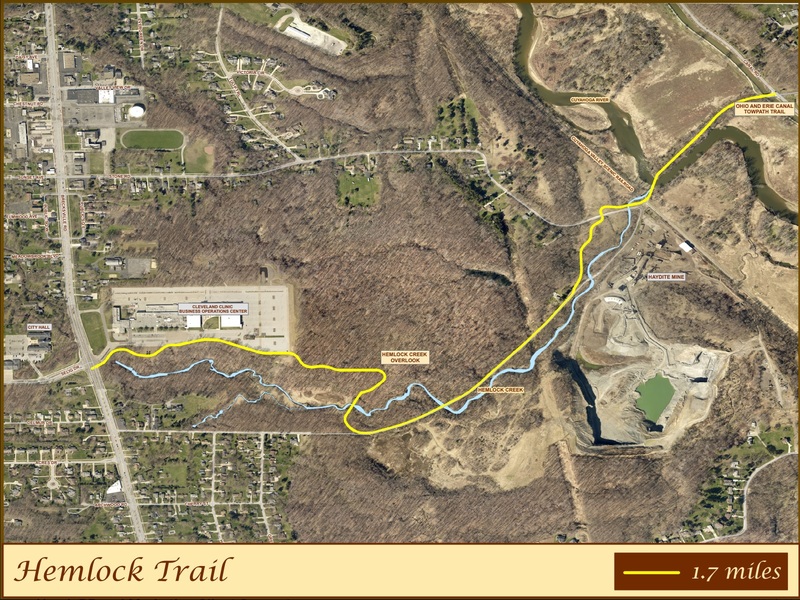 On National Trails Day, June 2nd, over 80 officials, trail enthusiasts, and project partners gathered in Independence to celebrate the groundbreaking for Hemlock Creek Trail. The 1.7-mile trail is part of the West Creek Greenway, an evolving 25-mile network of public trails and conservation lands radiating from the West Creek valley in Parma. The Hemlock Creek segment will link the Greenway directly to the Towpath Trail. A second connection of the Greenway to the Towpath will be three miles north in Cuyahoga Heights. The concept of the West Creek Greenway originated some 20 years ago with West Creek Conservancy founder Dave Vasarhelyi. Public support grew steadily as the Conservancy rallied citizens and civic leaders. In coordination with the Conservancy, Ohio U.S. Rep. Dennis Kucinich earmarked $2 million for the Hemlock Creek Trail in the 2005 Federal Transportation Bill. The City of Independence, West Creek Conservancy, and other partners then helped secure the required additional funding, including the ODNR – Clean Ohio Trails Fund. Named for the stream flowing prominently through the heart of Independence, and whose course it will closely follow, the Hemlock Creek Trail will become the largest community connector to date along Ohio’s 110-mile Towpath Trail, which when finished will extend south along the old Ohio & Erie Canal corridor from Lake Erie at Cleveland to New Philadelphia, Ohio. 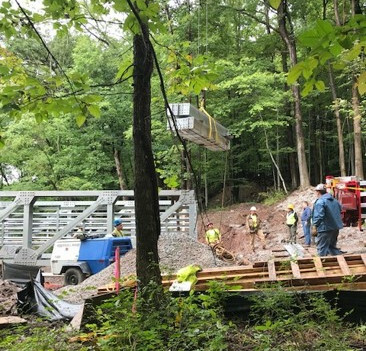 The 10-foot wide asphalt all-purpose Hemlock Creek Trail will extend from Brecksville Road at Selig Drive, past the Cleveland Clinic Business Operations Center, and follow Hemlock Creek through parts of the former William H. Hunt estate in the national park. It will reclaim the abandoned part of Hemlock Road as it descends to Stone Road. A 200-foot pedestrian bridge across the Cuyahoga River will rejoin the long-separated parts of Stone Road. (County engineers had removed the original 1898 iron span in 1988.) Once east of the river, Hemlock Creek Trail will follow the abandoned Stone Road in the Village of Valley View to join the Towpath. 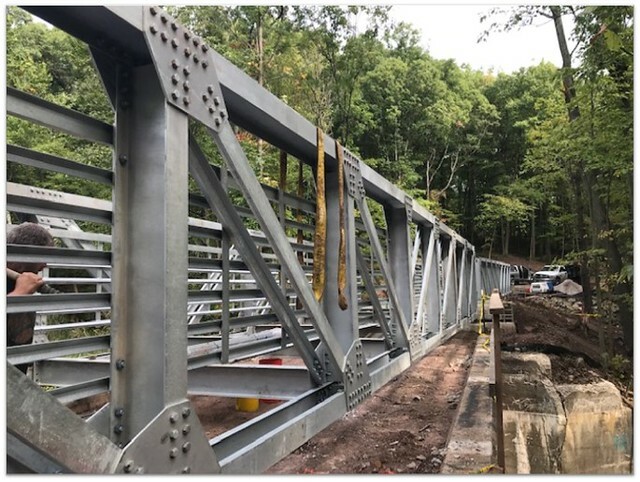 Completion of Hemlock Creek Trail is slated for spring of 2019. Meanwhile, West Creek Conservancy will provide updates and free guided walks along the developing Trail and other parts of the West Creek Greenway to showcase the scenic and historic nature of the area. Visit our blog and our events page for the latest news on these activities and other Conservancy projects, or call 216-749-3720 to be placed on the notification list.